It’s Post-Christmas Pie Day Friday! A.k.a Boxing Day, a.k.a let’s just go with the pie because what even is “Boxing Day?” Someone in Britain made it up I think? I just know it has literally nothing to do with boxing. So. 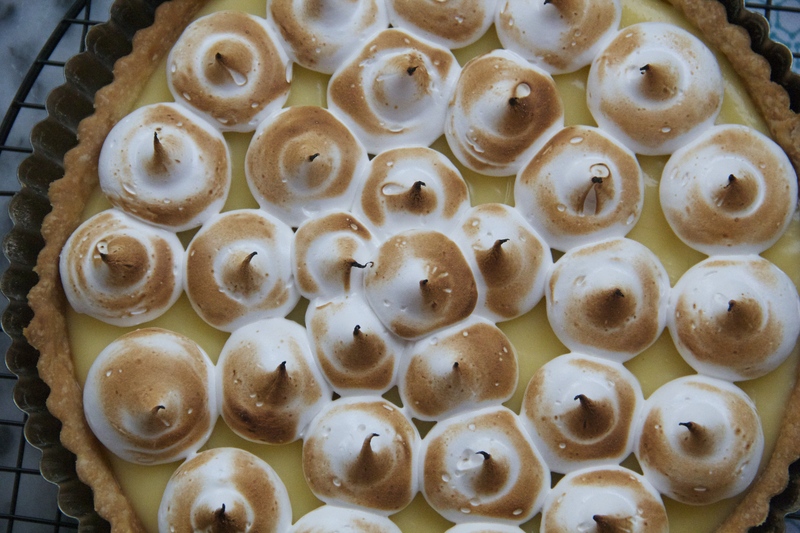 Lemon Meringue Tart! This feels right for today. (FYI, in the realm of Pie Day Friday, tarts are fair game. Thank goodness). There are three main components/steps to get this thing up and running (into my/your mouth): crust, curd, and the aforementioned meringue. Crust is easy (and, if you want to, you can use store-bought — I won’t tell). Lemon curd is simply a matter of gentle heat, steady stirring, and then straining through a fine sieve. And meringue? A hearty whip whip whip and we’re pretty much there! Can’t you see this beauty going down smooth with a little bubbly, and wow-ing everyone on New Year’s Eve? I can see it. The end of 2014 is going to be tart and sweet and great. Cheers to 2015! Roll out the dough into a large circle, about 1/4-inch thick. Press the dough into the bottom and up the sides of an 8- or 9-inch tart pan, cutting off any excess. Place the tart pan in the refrigerator to chill for about 20 minutes. Meanwhile, preheat the oven to 350 degrees F. When the dough has chilled, prick the dough at the base of the tart a few times with a fork (this is called “docking” the tart shell), place a piece of foil over the dough and weigh it down with pie weights (or dried beans), and bake the tart shell until the sides look golden brown. Remove the foil and pie weights, and continue to bake the shell completely, until the bottom looks golden and feels dry to the touch. Allow the blind-baked pie shell to cool completely while you make the filling. To make the filling, combine the sugar, lemon zest, lemon juice, eggs, salt and butter in a large, heat-proof bowl. Place the bowl over a saucepan of simmering water, and cook the mixture over low to moderate heat, whisking occasionally, until it has thickened significantly (the finished curd will have the consistency of hollandaise sauce – it will leave a firm line on a spatula when you swipe your finger across the surface). Strain the curd through a fine strainer into another bowl, and cool the curd with plastic wrap pressed directly on its surface (to prevent a skin from forming). When the curd is almost or completely cool, pour it into the baked tart shell (you’ll have some curd leftover – jar it and save it to put on toast or dollop into yogurt! ), and smooth it out with a spatula. 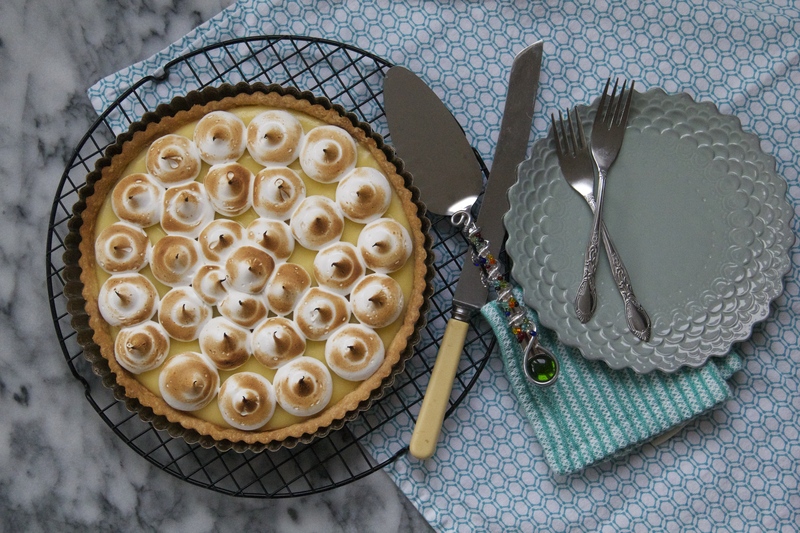 Place the filled tart in the refrigerator to set up while you make the meringue. To make the meringue, whisk together the sugar and egg whites in a large heatproof bowl (or in the bowl of a standing mixer). Place the bowl over a saucepan of simmering water, and cook the mixture over low heat, whisking regularly, until the sugar has dissolved into the egg white and the mixture feels very warm to the touch. Immediately start beating the mixture with a handheld or stand mixer (fitted with the whisk attachment) on medium-high speed. Continue to beat the meringue until stiff peaks form. Whisk in the vanilla. 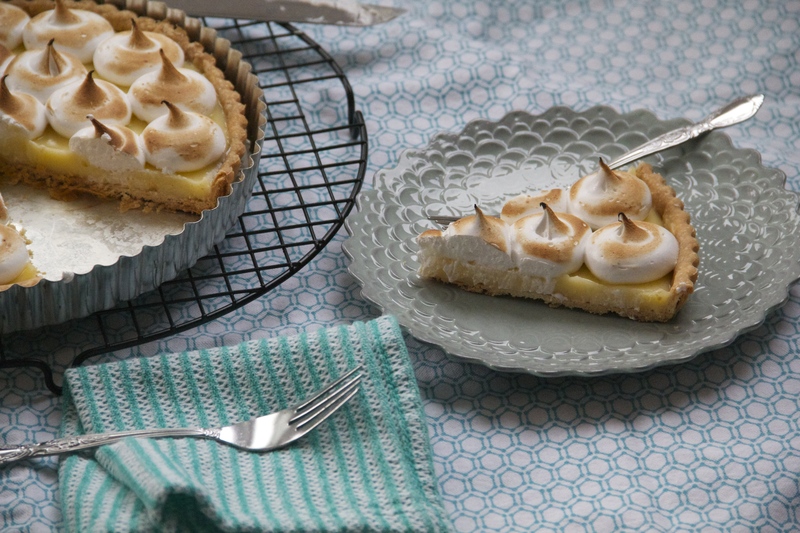 Spread or pipe the meringue onto the cooled lemon tart. 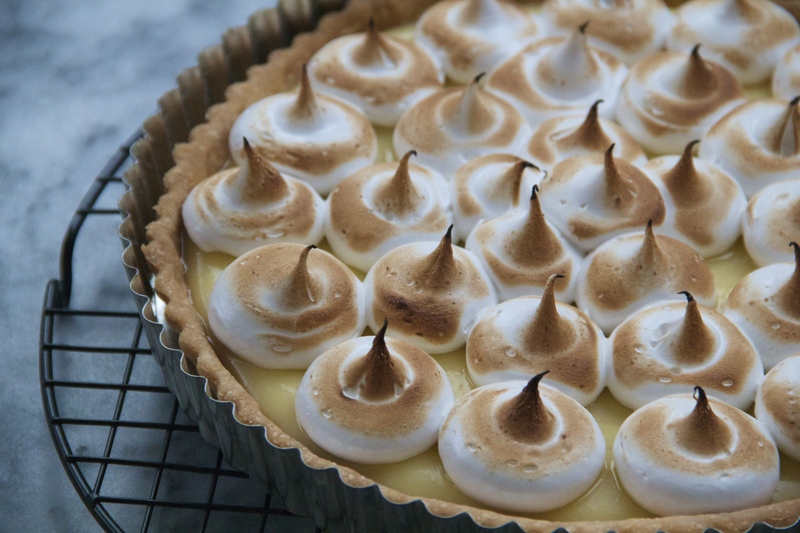 If you like, use a kitchen blowtorch or your broiler to brown the meringue, being very careful not to burn it. The tart is best the day it’s made, though it will last for a day or two, uncovered, in the refrigerator. I like to serve the lemon tart slightly chilled. 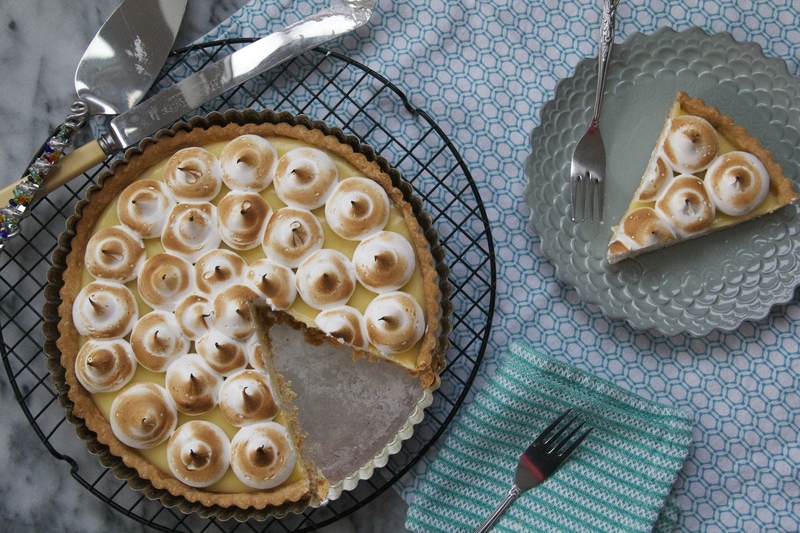 I love lemon curd, and I want this tart. Fantastic pictures of your tart and well it just plain looks delicious. If I made it I’m afraid I would screw it up. But it may be worth the try!